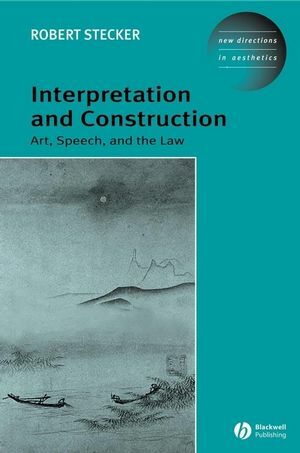 Interpretation and Construction examines the interpretation and products of intentional human behavior, focusing primarily on issues in art, law, and everyday speech. Focuses on artistic interpretation, but also includes extended discussion of interpretation of the law and everyday speech and communication. Written by one of the leading theorists of interpretation. Theoretical discussions are consistently centered around examples for ease of comprehension. Robert Stecker is Professor of Philosophy at Central Michigan University. He is the author of Artworks: Definition, Meaning, Value and many articles in aesthetics, the philosophy of language, and the history of modern philosophy. 2. Art Interpretation: the Central Issues. 3. A Theory of Art Interpretation: Substantive Claims. 4. A Theory of Art Interpretation: Conceptual and Ontological Claims. 6. Moderate and Historical Constructivism. 7. Interpretation and Construction in the Law.